Here's a valuable information on pianos ; Find great tips on how to take care of your piano and to make sure it stays in a good condition. If you have a piano you know how rewarding such an instrument is. A piano is a durable instrument that brings quality which can not be compared by any other instrument. In order to make sure your piano stays in a terrific condition you have to reward this back instrument by maintaining it regularly. But what do you need to do exactly? Where to start? And how often should you do it? The piano is made out of different materials such as wood, metal, buckskin and wool. They are all combined in a unique mechanical way that gives the piano its' unique sound. When we take care of our piano we have to keep three elements in mind: The pitch, the tone and the touch. We maintain the pitch by tuning the piano. The full tone quality is maintained by voicing and the touch is maintained by periodically regulation of the piano action. Take my advice; keep your piano in a good shape since an out-of-tune piano or an unresponsive touch can discourage even amateur pianists. If you maintain your piano periodically you prevent big expenses in the future. Piano tuning is the adjustment of the tuning pins so that all the strings are of the proper tension (pitch), to have the correct sounding, musical intervals. The piano was specifically designed to be tuned to the international pitch standard of A-440 cycles per second. Your piano will sound in its best and will delight your ears, while an off key piano is nothing more than a headache. Let your ears get used to a healthy sound. - Keep the keyboard covered in order to prevent it from gathering dust but make sure that the keys are exposed to light once in a while so that the ivory keys won't turn into yellow. The piano keys needs to be wiped with a dry cloth once in a while. The can also be cleaned with a damp cotton cloth but make sure you dry them immediately afterwards. If you still have some stains you can use some mild soap or moisten the cloth with dishwashing detergent before wiping. However, don't use chemicals or solvent! Call a piano technician to help you clean what can't be wiped away. and Keep food and drinks of the piano. In many cases, once liquids are spilled, the damage is irreversible which is why prevention is the safest rule to follow. Damaging the piano's wood finish would be a shame. Feather-dust the piano first (lightly so it won't get scratched), the wipe it with cotton damp cloth in the direction of the grain. Then go through it again with a dry soft cotton cloth. Avoid aerosol spray polishes that contain silicone. Your technician may suggest a specific brand name. Inside the piano, a complex mechanism is taking action. It is made out of copper wound strings, being strung by a hammer made out of felt inside a mostly wooden soundboard. Levers, little springs and hammers take a part in this delicate action. Once in a while it is handy to regulate your piano action and make sure it is still as responsive as it used to be when it just came out of the factory, since the wood and felt parts might wear because of humidity. Resist dusting the inside of your piano, oiling the moving parts, or using moth or insect repellents. Your piano technician will take care of all internal problems. Extreme changes of humidity are harmful to the piano. The changes of weather and temperature effect the tuning of piano. (If it's dry your piano goes flat and the moisture makes it go sharp). The soundboard of the piano might crack or distort and the glue joints that hold the wood portions might get weaken. The strings tend to get rusted when there's too much moisture. Pianos are happiest in a relative humidity level of 40 to 45 percent. Adding a humidifier to your central heating system will reduce the extremes of high and low humidity. If you don't have a central humidifier/dehumidifier, consider getting a room humidifier for the winter, and a room dehumidifier or air conditioner during the summer months. 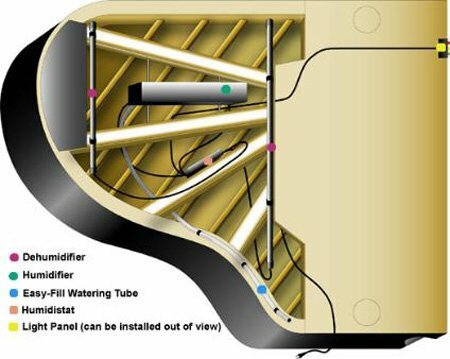 There's even such thing as a special piano humidifier/dehumidifier that can be installed in your piano. Ask your piano technician. It's important to keep your piano away from a heating register in winter, an air conditioning vent in the summer, a fireplace, and a frequently opened window or outside door, and direct sunlight. When the felt hammers wear the quality of the tone get uneven. Periodic voicing of the hammers will guarantee that the piano will be able to produce the widest dynamic range and a full tone quality. How Often Should I Get My Piano Serviced? It is better to get you piano serviced at least two to four times a year. 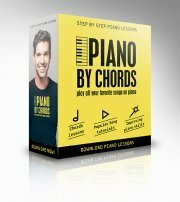 By doing so you guarantee that the piano will sound well every time you sit down and play. If you buy a new piano give it an extra attention in its first year since its tuning is still rather instable and the elasticity of the piano wire and the adjustment to humidity changes in your home. Most important! Make sure your piano is performed by a qualified piano technician. The best is to play you piano regularly. After all that's why it's meant for. A piano that is not played regularly and suffers from a service lapse might have a problem that can't be identified during a regularly service. If you have haven't tuned your piano in year than your piano must go through a pitch raise which takes extra time to do. If you're piano is old it might need to go through rebuilding or reconditioning. 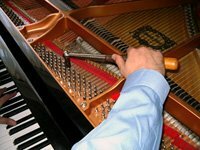 Choose a piano technician that is at home with tuning, regulating and repairing pianos. Someone you feel comfortable with asking all sorts of questions concerning your piano performance. If your piano technician is interested in your piano an is willing to give it a full service then you know your in the good direction. Please, please don't try to repair a piano yourself, even if it seems easy to do like replacing a loose key ivory. You better call a qualified technician instead since he has the knowledge and the proper tools and part to make such repairs easily and correctly. Avoid paying a lot of money for making an amateur mistake. Oh, and one more thingâ¦ Don't move a piano yourself! It's HEAVY!! Avoid a broken leg, a broken expensive vase or worse... a broken instrument.